In an earlier posting about cabinet cards, I mentioned that although the format was first introduced in the mid-1860s, it did not really catch on until the mid-1870s. It is possible that this was due to its relatively higher price, compared with the carte de visite. 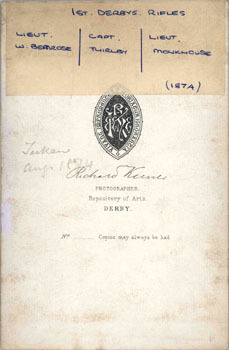 This cabinet card was produced by innovative Derby photographer Richard Keene in August 1874 and, as with many early examples of the format, it actually had the words "Cabinet Portrait" written on the front of the card. 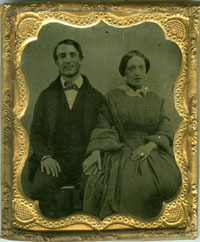 The early cabinet card can be identified, in the same manner as its smaller predecessor the carte de visite, by the square corners. 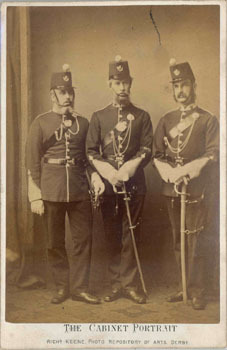 The inscription on the reverse of this fine portrait identifies the three men in military uniform as Officers of the 1st Corps, First Battalion of the Derbyshire Volunteers (1st Derbyshire Rifles): Lieutenant William Bemrose (1831-1908), Captain John Farmer Thirlby (c.1839-) & Lieutenant Henry Monkhouse (1837-1905). William Bemrose was a partner in the printing, publishing and stationery firm, Bemrose & Sons. 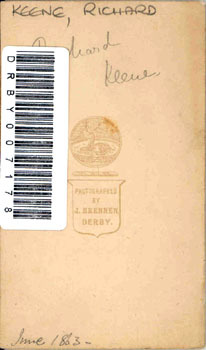 John F. Thirlby was a bank clerk and secretary of the Derby Gymnasium Club. Henry Monkhouse was a chemist's assistant at the time this portrait was taken. 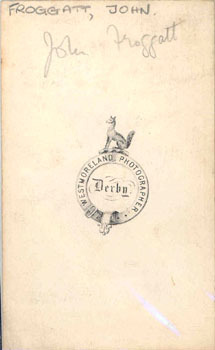 William Walter Winter (1842-1924) was one of Derby's more successful photographers. He was the son of Cornelius Jansen Walter Winter (1819-1891), a Norfolk portrait and animal painter, and started off as an assistant to Frenchman Monsieur E.N. Charles (1827-1864) at 2 Midland Road, Derby. When Charles died in 1863, his widow Sarah ran the studio with Winter, then married him in 1864, after which Winter took over the studio. It continued to operate under his stewardship until his retirement in 1909. He sold the firm the following year, and the business is still operating today, from their premises at the Alexandra Room Studios, built to a design by the Derby architect Henry Isaac Stevens. W.W. Winter died in 1924. 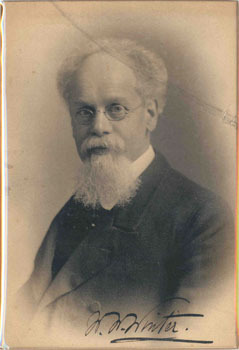 This portrait was probably taken by Winter himself shortly before his retirement in 1907, when he was a Justice of the Peace for Derby. Joseph Wheeldon Price (b. 1830) opened his first studio in Ashby-de-la-Zouch (Leics) in the mid-1860s, and by 1870 was operating another branch at Babington Lane in Derby. 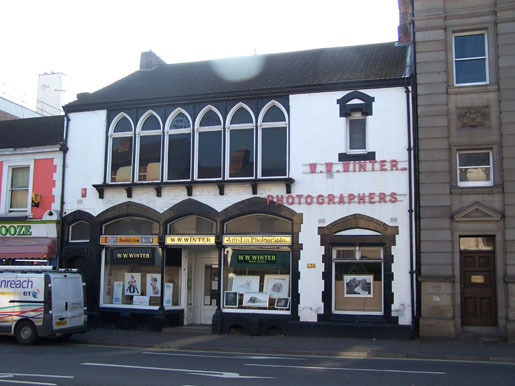 Although the Ashby premises closed in the early to mid-1870s, Price took over another studio at 36 Victoria Street, Derby from Clement Rogers for a brief period from 1876 to 1880. 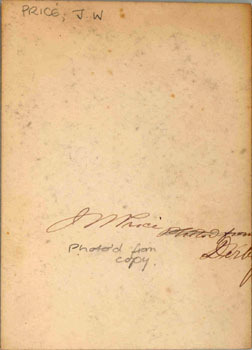 The vignetted head-and-shoulders portrait shown above is a mounted albumen print marked with his signature - very similar to the signature printed on CDV mounts - on the reverse, as well as "Photo'D from copy" in the same hand. It was probably taken in the early 1870s when he was in his early forties. For a few years in the early 1880s, he was in partnership with a travelling photographer Benjamin Galvin (1828-1900) and quite a few examples of CDVs and cabinet cards with Price & Gavin's stamp exist. Then, in the late 1880s Price retired to Liscard on the Wirral (Cheshire), where he ran a tobacconist's shop. The Babington Lane studio was subsequently operated by Edmund & C. Hopkins (1891) and Charles Carr, Gilbert & Co. (from 1895), who remained there until at least 1903. In the collection of portraits at the Derby Local Studies Library which I looked through recently, I was excited to find several of the photographers themselves. This one is a portrait of one of Derby's leading photographers, Richard Keene (1825-1894), by James Brennen. 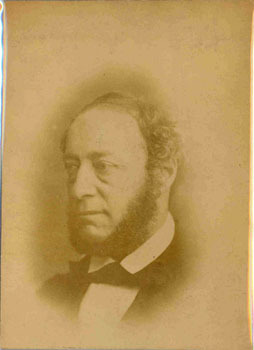 It is dated on the reverse, June 1863, about four years after he had established his own portrait studio. Although primarily a printer, bookseller, stationer and, by 1855, publisher of the Derbyshire Telegraph, he developed an interest in photography, and travelled throughout Derbyshire with friends, taking pictures of architecture, topography and landscapes. He started by selling prints of the high quality photos for which he became reknowned, but also set up and operated a successful portrait studio from at least 1859, produced private commissions for firms, estates and families, and took photos in many other counties. He was an associate of Fox Talbot, and his work reportedly included commissions by the Royal Family. In 1884 he was a founder member of the Derby Photographic Society, he was the recipient of 34 major awards, and he also became President Elect of the Photographic Convention of the United Kingdom. The other type of photograph which became wildly popular during Victorian times was the stereoscopic photograph, or stereoview. This used two juxtaposed separate images, taken of the same view but from slightly different positions, and a special viewer, to trick the eyes and brain into "seeing" a three-dimensional picture. Although the concept had been around even before the development of photography, the first stereoscopic views were made using daguerreotypes and ambrotypes in the 1850s and early 1860s. 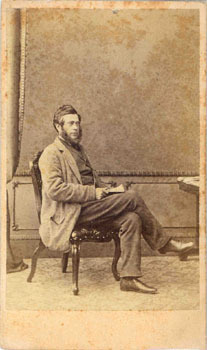 The use of albumen paper prints mounted on card in the later 1860s made them much cheaper, therefore available to the the middle classes, and starting photography's first craze. It should be noted that while stereoviews were arguably more suited to the use of landscapes, buildings, statuary and staged tableaux, rather than portraits, the latter are not completely unknown. 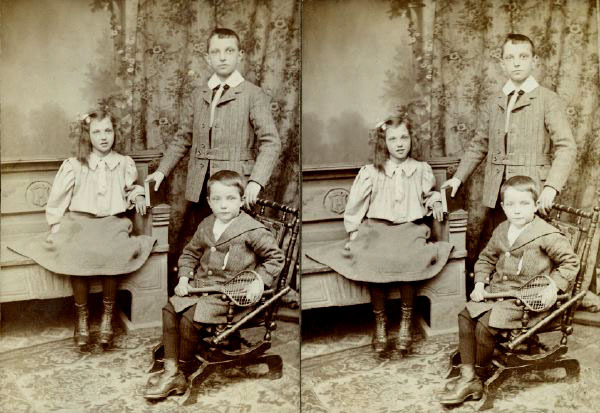 Hans Peter Hansen (1868-1943) of Ashbourne was one Derbyshire photographer who experimented with sterescopic portraits, as in this example showing three of his children. Robert Leggatt provides a brief history of sterescopic photography, as do many others, and I will not bother to to repeat this detail here. The popularity of stereoviews continued to grow in spurts through the 1870s and 1880s, fuelled by the development of steamships and cheap travel. The stereoview could in many ways be considered the forerunner of the postcard, and of course the latter eventually caused a wane in popularity. 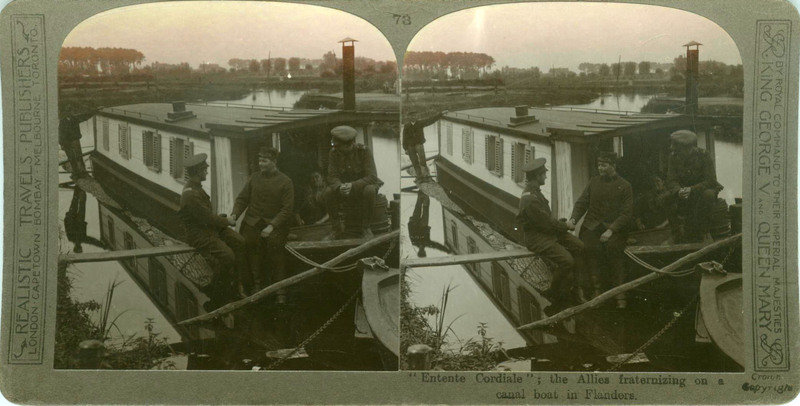 During the Great War, however, there was a significant resurgence of interest in the stereoview as a means to portray views of the battlefields to family and friends back home. 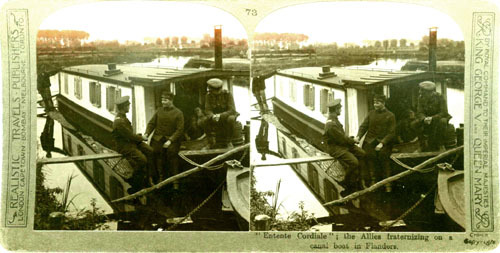 This image is one from my own collection, captioned "Entente Cordiale; the Allies fraternizing on a canal boat in Flanders," shows a lighter moment away from the front lines. It was No. 73 in one of many series produced by perhaps the largest of the stereoscopic publishers, Realistic Travels Publishers, of London, Cape Town, Bombay, Melbourne and Toronto. "Stereoviews on paper actually appeared in the 1850s as both salt and albumen prints. I can't really agree that stereoviews influenced postcards all that much. The creation of the postal service and cameras mass produced in postcard format had more to do with it. Stereoviews actually survived and flourished long after the advent of postcards." Some years ago I scanned some old photographs in an old album owned by my uncle. The pictures comes from my granddad family photo album. One photo is of a woman. In the footer it says "By Special Royal Warrant" and "A. & G. Taylor - Stockton on Tees & West Hartlepool". We have no clue whatsoever on who this woman is. An other major problem is that we do not have any names for any picture in the entire album. And most Norwegian photographers for our area were bombed during the Second World War. Other pictures in the album seems to be from around 1910, though we can't be quite sure. Do you think it is possible to find some more information regarding this photo? Does the archives of A. & G. Taylor still exist? I don't have details of when the branch studios of A & G Taylor operated in Stockton-on-Tees and West Hartlepool, both located in the county of Durham, and the only information provided by Roger Vaughan on his list is, "c1896, 106 High Street, Stockton." However, I can answer the question about the possible existence of archives of the studio, recording the names of subjects of portraits, with a fair degree of certainty. The chances of them surviving are almost nil. There are a few negative books from Victorian studios which do exist - Roger Vaughan presents one for the Harrow Branch of Hills & Saunders Photographers on his site - but I'm sorry to report that most have vanished. 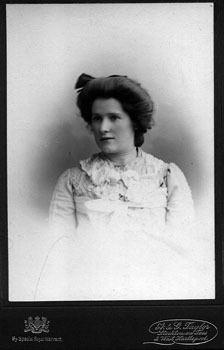 I estimate, from the style of the cabinet card, including its square corners and embossed frame, as well as the woman's clothing and hair style, that the photo was taken around the turn of the century, perhaps between 1898 and 1902. She looks to be in her early 20s, and was therefore perhaps born in the late 1870s. Without further information, it would be very difficult to deduce anything further about the subject. Over the last couple of years I've been sent several portraits by the firm of A & G Taylor and, although I have a profile of the Derby branch, and there a couple of accounts of the studios on other sites (by Roger Vaughan's study and Peter Stubb's Edinphoto study), it might be interesting for readers to see some images of a selection of their CDVs and cabinet cards here. I do know it was taken in their Edinburgh studio. The couple came from Harthill, between Glasgow and Edinburgh. He was born in 1843 and she in 1848 and she died in 1882 and he in 1884, and I understand Taylors operated from 63 Princes Street 1878-1910. Is there any information that can be elicited from this photo - he was a farmer (he died in a shooting accident) but looks very far from my idea of a rugged outdoor worker! 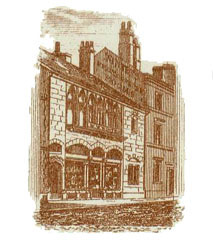 Peter Stubb's profile of the Edinburgh branch indicates that it operated from 1878 to 1910. This appears to be a cabinet card and the card mount is of a style commonly used by many A & G Taylor branches through the United Kingdom in the mid-1890s. It is glossy, thick card, probably with a blank reverse. 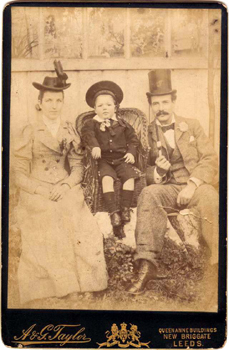 I have a similar cabinet card of my grandfather and great-grandparents, shown below, which was taken - despite the mount indicating "Leeds" - at Derby c. 1896-1897. The portrait of Diana's great-grandparents was certainly not taken in the mid-1890s. The pose, hair styles and clothing (e.g. her narrow sleeves and pleated bodice) are characteristic of the late 1860s and early 1870s. It is worth comparing the pose with that in the ambrotype shown below, which I have tentatively dated as being from the early 1860s. The woman's hair style, drawn back well behind the ears, suggests that its was taken in the late 1860s, rather than early to mid-1860s, when only some of none of her ears would be showing. 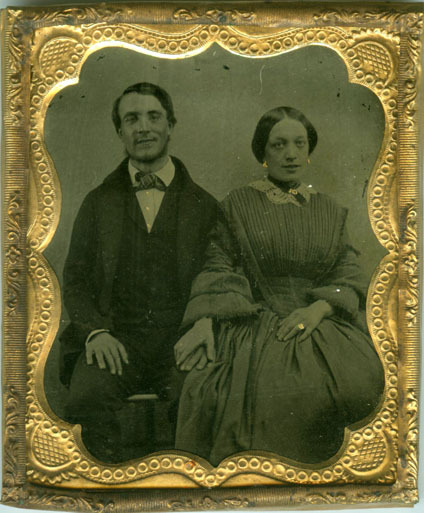 The cabinet card must therefore be a copy made of the original portrait, probably a carte de visite, some 25 years or so later. 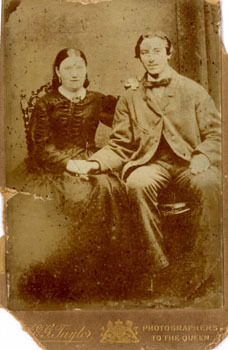 The couple appear fairly young to me, perhaps in their early 20s, and it may well have been a wedding portrait, as I have assumed for the ambrotype shown above. My guess is that the couple would have been born between 1842 and 1850, and I hope this fits with the dates that Diana has forher great-grandparents. This carte de visite is the first portrait that I have found by one of Derby's earliest photographers, John Westmoreland (1820-1895). Arriving in Derby in the late 1840s, he worked for John Davis & Son, a firm of opticians, mathematical & mining instrument makers and photographic equipment suppliers in Irongate. He was primarily employed as an mathematical instrument maker and optician, although Craven (1993) reports that photographs by him from the period 1855-1861 are known. 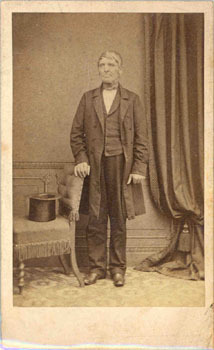 According to the caption on the reverse of the card mount, the elderly man with the coat and top hat is John Froggatt. I estimate that he is in his 60s or 70s, and that the photograph was taken in the very early 1860s, implying a birth date of the 1780s or 1790s. I haven't yet been able to find out anything about this gentleman, and would appreciate any hints from readers as to who he might be. Apologies for the hiatus in Photo-Sleuth postings, which has been partly due to a long awaited family holiday to England. During this trip, I managed to fit in a visit to the Derby Local Studies Library (LSL), just off Irongate. A few years ago, not long after I started compiling the Index to Derbyshire Photographers & Studios as an online resource for local and family historians, I received an email from noted Derbyshire historian, and ex-chief archivist at the Derby Local Studies Library, Maxwell Craven. He told me of the existence of a large collection of old portrait photographs held by the library, guessing that it would be of great interest to me in my studies of early Derby portrait studios. This collection is currently being digitised by the library, and will be made available online on the Picture The Past web site. However while at the library recently, I was very fortunate to have the opportunity to look through several hundred portrait photos. The visit was kindly set up for me by Jane James, who is the Derby LSL's part-time family history researcher, and with whom I had communicated previously on other matters. She confirmed the existence of the portrait collection, and spoke with the Senior Librarian Trish Kenny about the nature of my web site. I was informed that the Derby LSL wishes to encourage such projects, creating resources for the use of the general public, and to this end would permit me to scan a selection of the photographs for reproduction on the web site. Trish and the other two library staff members, Mark Bowyer and Fiona Nevin, were very helpful, and I managed to come away a few hours later with detailed scans of several dozen cartes de visite, cabinet cards and portraits of other formats stored handily on a USB drive. I'm grateful to all of them, both for the opportunity and for the assistance. I hope I can do them justice. Over the last few weeks, I've been steadily going through these scans, compiling them into the portfolios of photographers on the web site. Some of them are already online, for example in the profiles of James Brennen, John Burton & Sons, Richard Keene, J.W. Price, Clement Rogers and W.E. Swift. However, I thought I'd also preview some of the more interesting portraits in a series of postings here. A large proportion of them are from the Derby studio of W.W. Winter, which is still going. My brother and I walked past the premises several times recently, as it is only a short walk from the Derby railway station in Midland road. ... and the same building now, largely unchanged. 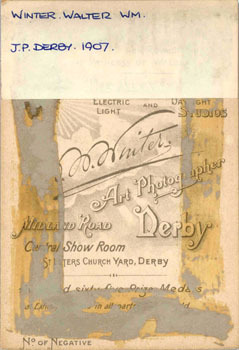 I will admit to being a little disappointed in the relative dearth of examples by other early (1860s) Derby photographers, of whom there were many, but this was more than made up by the fact that almost all of the portraits in the collection have the subjects named, and many are also dated. They portray men - and occasionally their wives - who were prominent members of the Victorian Derby community, including textile manufacturers, brass founders, engineers, mayors, magistrates, aldermen, a vaccination officer, clergymen, policemen, legal practitioners, a newspaper proprietor, innkeepers, bank managers, volunteer militia officers, stationers, printers, railway clerks, landowners, chemists, farmers and maltsters. I have thus been able to make some valuable additions to the portfolios of several studios. In fact, I've had to revamp the W.W. Winter profile, resulting in a complete revision of the classification and dating of the various card types. This part of the project is not yet complete, but I hope to have it finished and uploaded early in the New Year.